* Results may vary depending on application. It’s what sufferers of hair loss and balding have waited for all their lives! 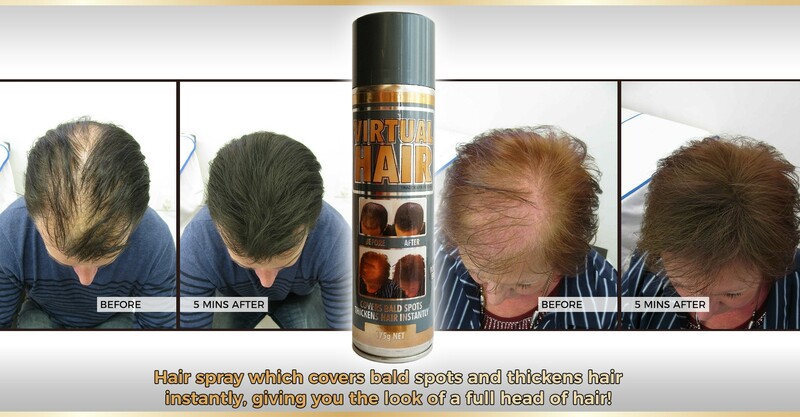 !…an incredible new hair spray product that makes you look as if you have the fullest, thickest head of hair. On close inspection, in any light, you will appear to have a full head of hair! This amazing hair spray consists of tiny fibres which attach themselves to your own thin hair, building upon themselves until each of your hairs appears vastly thicker than it actually is. VIRTUAL HAIR will not run with perspiration nor in the rain. It comes off only with rubbing or with shampoo and warm water. You can even swim with it! Your days of embarrassment and hiding in the shadows are over! 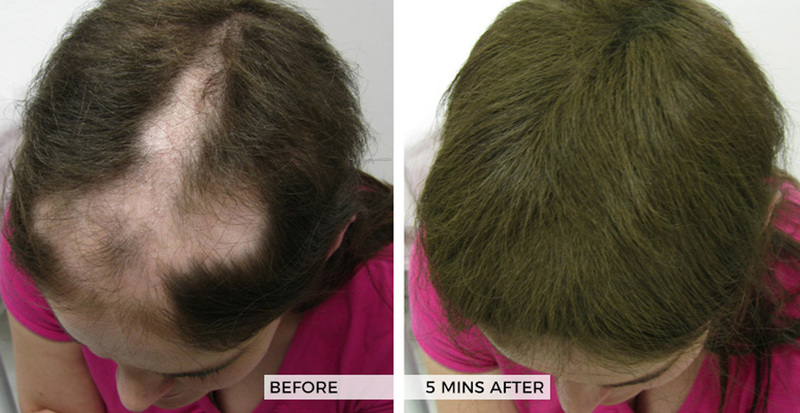 VIRTUAL HAIR will boost your confidence and transform your appearance! 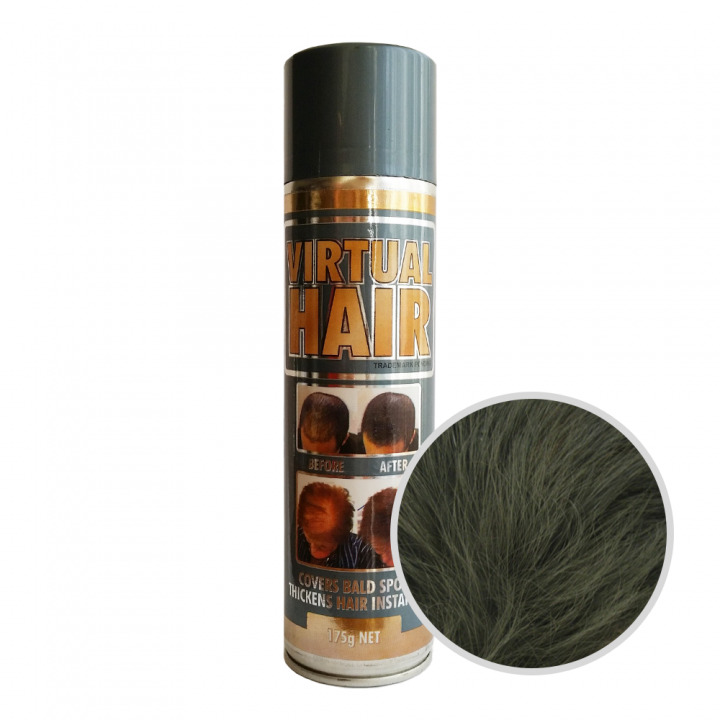 Virtual Hair comes in six different colours: Black, Dark Brown, Medium Brown, Light Brown, Blonde and Silver Grey. These colours can be used alone or in combination to blend and achieve the perfect match to your own hair colour. Even on close inspection, the Virtual Hair fibres will be undetectable and make you look like you have a full, thick head of hair. There are approximately 60 applications in each can. Finally revealed and available to the South African public! This revolutionary product was originally developed and is still used today for actors and actresses on the sets of the Hollywood film studios in the USA where it needed to meet stringent criteria and stand up to harsh indoor and outdoor conditions. It needed to work in the sun and in the rain, through sweat and tears. It is now widely used internationally by actors and musicians whilst performing on stage and of course by the public at large. Virtual Hair works for Male and Female Pattern Balding, Alopecia areata, traction alopecia, trichotillomania, telogen effluvium and any type of hair thinning condition. It can also be used simply as a cover spray to cover grey roots. There does need to be some hair on your scalp for the micro-fibres to cling to. If you are shiny bald, it will not work. 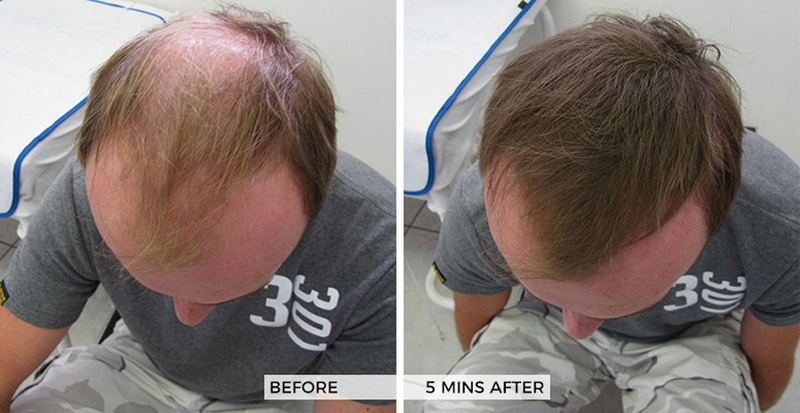 I first heard of the spray that covers bald patches on a visit to The Hair Loss Clinic. It was sprayed all over the top of my head where I was going bald and as you can see from the photo it was amazing! All the people that I knew and came in contact with could not believe how my hair looked. I now use it at least once a week and could not go without it. People that don't know me do not even realise that I am going bald. My friends that are going bald have even started asking me where they can get hold of the product. I have now got my confidence back and am not so embarrassed about people who used to comment on how bald I was getting. 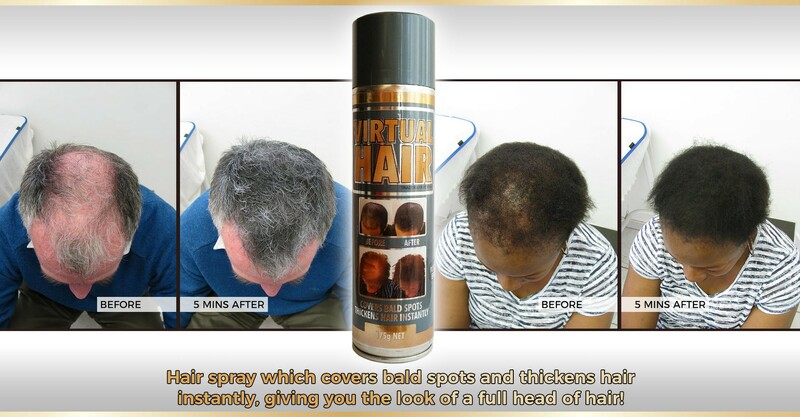 The Virtual Hair spray consists of a silica powder that behaves like micro fibres. When it is sprayed onto thin hair, the micro fibres attach and layer themselves on top of each of your own hairs making each hair appear many times thicker than it actually is. Even up close, it looks like real hair! Virtual Hair doesn’t run with perspiration, nor in the rain. It only comes off with rubbing or with warm water and shampoo. If you sleep with it at night and rub your head on the pillow, some of the powder will come off on the pillow but your hair should still look great. Virtual Hair stays on your hair until it is washed off in a proper warm water and shampoo wash. Some people spray a normal hairspray on top of Virtual Hair to seal it in place and give it a more glossy look, but this is only essential to do for night-time flash photograpy. In all other circumstances, it can be worn on its own. Look at the videos on this website to see how it is applied. If you have no-one to apply for you, no problem… Stand with your back to a large mirror and use a sweat band to cover your forehead. 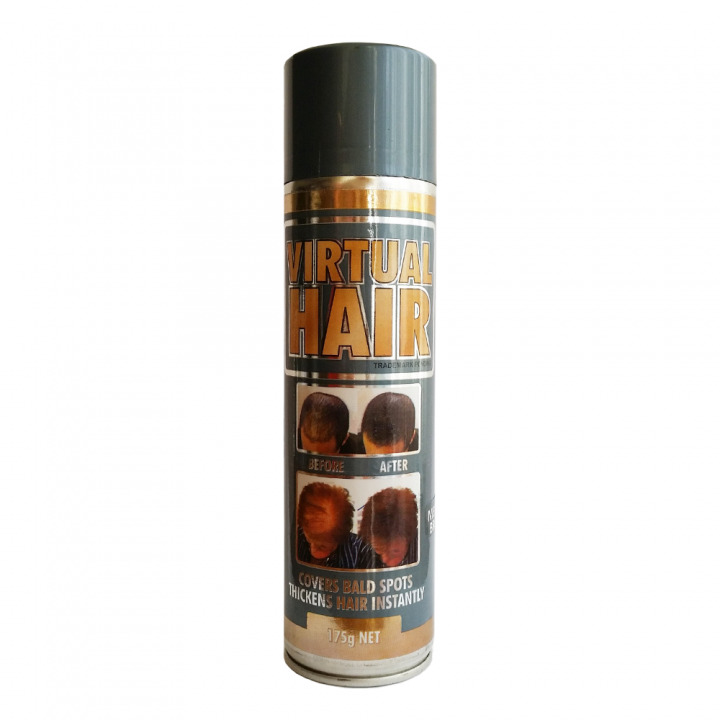 Then use a hand-held mirror in your one hand and spray Virtual Hair with your other hand after giving the can a good shake. After allowing the Virtual Hair about 5 minutes to dry, brush and style your hair as normal. Also, look at the amazing “ before and after photos” which are taken literally 5 minutes apart! There are about 60 applications in each can.